We’d love your help. 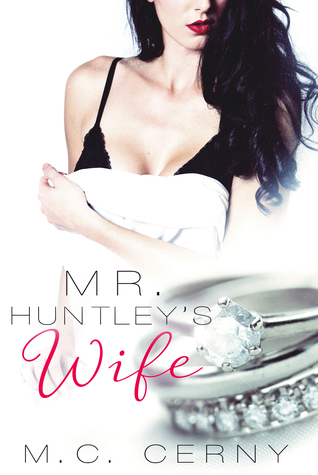 Let us know what’s wrong with this preview of Mr. Huntley's Wife by M.C. Cerny. Adam Huntley is not who he seems under the scars and tattoos. Elizabeth Huntley is a woman scorned. A wife forgotten. A web of lies and deceit tie them together until the fragile threads begin to fray piece by piece. Adam returns thinking his wife will forgive him... little does he know, she plans to kill him. A full length dark romance standalone. Intended for mature audien Adam Huntley is not who he seems under the scars and tattoos. Intended for mature audiences and includes dark themes. To ask other readers questions about Mr. Huntley's Wife, please sign up. Mr. Huntley’s Wife is a suspenseful and gripping read. Elizabeth comes from a hard life. Adam has a vision of what he wants with Elizabeth; he also does not take no for an answer. By use of manipulation and mob tactics Adam gets what he wants. Aaron definitely is a huge twist in this story and not what I expected as the brother of Adam. The ending of the book is a definite twist. This book does contain abuse and violence which could cause triggers for people. It is a great read and one you don’t Mr. Huntley’s Wife is a suspenseful and gripping read. Elizabeth comes from a hard life. Adam has a vision of what he wants with Elizabeth; he also does not take no for an answer. By use of manipulation and mob tactics Adam gets what he wants. Aaron definitely is a huge twist in this story and not what I expected as the brother of Adam. The ending of the book is a definite twist. Adam Huntley is a evil gun running mobster who loves to inflict pain and suffering on others. Elizabeth steals from him when she’s 14 and he immediately takes control of her life and makes it miserable. She becomes his wife of her 18th birthday and the hell gets worse. This is not a typical lovey romantic book. It’s violent and dark and has some weird twists. This was a rollercoaster ride that kept me guessing until the end! This suspense dark romance holy crap I didn’t want to stop reading until the end. Lizzie steals from mr Huntley she never Imagined him taking her and keeping her till she’s of age to be a young bride yes their are twists. Lies, deceit, corruptions and then love. When i first started reading I was like what the hell, but as the book progresses it becomes clear. Twist and turns at every page turn.